In 1887 the Brothers were invited to take charge of a school in the poorest part of the city of Waterford. In Stephen’s Street there had been a boarding and day school that was supported from annual grants from the city. In 1862 the grants were withdrawn and the school was placed under Waterford Corporation. Bishop O’Brien took over the premises under a lease for seventy- five years and opened an intermediate school for day- boys. It was named the High School of the Catholic University of Ireland. The school ceased to function in 1886. Father Phelan with the permission of Bishop Egan invited the De La Salle Brothers to staff the school that was now a national school. The invitation was readily accepted. The school was a three -story building with two large classrooms on each floor, with an entrance from Bachellors Walk. Beside the school was the house of residence where all the community lived. Classes commenced on October 8th, 1887 for students that ranged in age from eleven to thirteen. In late 1887 permission was sought to transfer the scholasticate from Castletown, Co. Laois. Newtown House, which stood on approximately six acres, was deemed to be most suitable as it had accommodation for thirty people. Before the purchase was considered the project was discussed with Bishop Pierce Power. He was informed that the young men who had completed the canonical novitiate and who were following a course of studies in preparation for their profession of teaching be afforded in the year preceding their examination, the opportunity to teach in and manage a large important school. As Castletown was no longer acceptable to the National Board and as St. Stephen’s Street was, the logical solution was at hand. Bishop Power gave the project his blessing. TheNewtown property was purchased for the Institute for £1,700 from Samuel Le Haut Hobson. The Brothers got possession of the property on the 20th June 1888. Six months later additional accommodation was needed and a third story was added to Newtown House. John Hearne was the contractor and the cost was £850. In 1890 Br. Justin McMahon the Provincial started preparing the way for a Training College in Waterford. He first had to obtain the support of the bishops in Ireland. Dr. John Egan Bishop of Waterford supported this new venture. On the 1st November 1890 Brother Justin made a formal application for the Training College in Waterford adding that “the students of the said college to be comprised of members of our society and other Roman Catholic Queen Scholars”. The bishops consented to allow secular students to be admitted when they were made aware that the Chief Secretary, Arthur Balfour, would withhold registration unless secular students were also enrolled. Bishop Egan notified the Commissioners of National Education of his willingness to fill the office of manager of the Training College and on the 11th May 1891 he was accepted for the position. During 1881 plans for the new college building were prepared. They were put out to tender and that of Mr. George Nolan was accepted. On 16th July Bishop Browning of Ossary performed the blessing and official opening of the new college building. Mass was celebrated by Bishop Sheehan and the Preacher Rev. T Finlay stated that the work which the college had undertaken was in unbroken communication with the work of the founder 200 years before. De La Salle had first shown his countrymen how to form Christian teachers; his disciples were showing the people of Ireland how the same work could be done. Over the years many teachers who were to have a profound influence on thousands of students throughout the length and breath of Ireland were trained in De La Salle College. In 1932 the Minister for Education, professor O’Sullivan stated that he was willing to sanction the establishment of a new school for boys in the unused portion of the buildings and premises of the Waterford Model School. The Brothers had been looking to set up such a school for some time. On the 3rd October, St. Declan’s was opened in part of the Model School that was built in 1859. In May 1939 the government decided that one Training College would be adequate to provide training for all the young men in the country. St. Patrick’s, Drumcondra was to remain open and De La Salle College was to close. Brother Philip Healy appealed to the Taoiseach, Mr. Eamon de Valera, to keep the College open but to no avail. In November the Minister for Education made one concession. Instead of closing down the College completely, the training of Brothers would be allowed to continue. For the next ten years, De La Salle College, Waterford was used for the teacher –training of young Brothers. The College was a huge drain on the Institutes resources. The grant allowed for training was totally inadequate and no provision was made for the payment of lecturers or the upkeep of the College. De La Salle College was a drain on the Institutes resources a solution was at hand. Brother Lawrence O’Toole decided that it should be turned into a secondary boarding and day school. On the 9th September 1948 the College was officially opened for secondary education. De La Salle Numbers rise. Over the years the College was becoming better known. In 1954 there were 111 boarders and 150 dayboys. A classroom block was built in 1955. In 1958 Upton House was purchased to accommodate extra boarders. In 1968 there were 230 boarders and 420 dayboys. Because of the increase in student numbers it was deemed necessary that a new wing be added to the College. New science laboratories and woodwork rooms were provided. The wing was completed in 1974. Further expansion of De La Salle College was deemed necessary in recent times. A new floor was added to the west wing. A new technology block was built which caters for the multitude of students doing Construction Studies, Technology Wood and Technical Graphics. New Science Laboratories and preparation rooms, a modern Computer Room, an Art Room and a Business Studies Room were some of the specialist rooms that were provided. New Changing Rooms were built and the Gymnasium was completely remodelled and refurbished. The College itself was completely redecorated. In September 2001 the College expansion and refurbishment was complete. A new generation can now make use of a modern College with a rich tradition. For over 120 years the De La Salle Brothers have been at the centre of education in Waterford. Today the Lasallian ethos lives on in the biggest boys school in the country. When De La Salle College opened in 1894 the new principal was Br. Thomas Keane. He had qualified as an engineer before joining the De La Salle brothers in California. 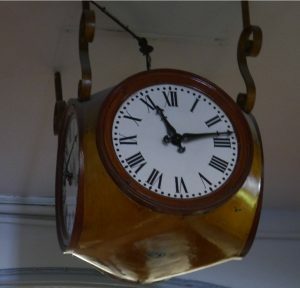 As a qualified engineer he was interested in the building of the college and was instrumental in having one of the most famous clocks in the country installed in the college. The clock system worked from a master clock in the belfry that had a bell attached as well. The bell rang every hour for as many rings as the hour itself. Every first quarter hour there were three slight rings, every half hour there were six slight rings, and finally at a quarter to the hour, there were nine slight rings. Also at five minutes before every quarter there was one light sound. One brother commented that it was very difficult to sleep with it. The clock and bell worked by means of weights and a steel mechanism. On the outside there are two faces, one each, on the front and rear of the building. Internally there are three clocks, on the ground floor, first floor and second floor respectively. On two of these there are four faces, and on the ground floor there is a clock with two faces. All clocks were worked from a main clock in the belfry, which was called the master clock. All other clocks both internal and external were totally dependant on the master. All the clocks worked by means of copper rods using a friction method, each rod being approximately 1¼ to 1½ metres in length. The lifespan of copper is about eighty years, so it was no wonder then that the clock stopped after seventy- five years because the copper rods had worn. In the mid 1960’s the clocks stopped at five minutes to eleven and time stood still for thirty years. In early 1998 the famous clock manufacturers Smiths of Derby introduced an electronic system and refurbished the faces and some of the hands. The new system is similar to the old one, only now there is a main consul and a transmission network. Michael Francis O Reilly was born in Baileborough in Co. Cavan on the 24th September 1847. The following year due to the Famine the family immigrated to America. They set up home in New York and Michael received his early education in the local De La sale school, St. Brigids. In 1949 at the age of twelve he entered the Novitiate in Montreal, taking the name Brother Potamian. After his novitiate he taught in De La Salle schools in Montreal, Quebeck and St Louis 1869-1870. Br. Potamian was an exceptionally gifted person concerned with the formation of his students as well as his own advancement in piety and scientific knowledge. Every free moment he had spent on extending his linguistic skills and scientific knowledge. In this way he became extremely proficient in four languages: English, French, Spanish and German and he excelled in Physics, Chemistry and Mathematics. In 1870 he was appointed to the Brother’s College, St Joseph’s, Clapham, London. Under his influence the college developed a reputation for the teaching of physics, chemistry and natural history. Br. Potamian obtained his B.Sc degree from the University of London in 1878. In 1883 he presented a thesis to the same university and was awarded the D. Sc. His thesis for the D. Sc. Was ‘The Theory of Electrical Measurements’. While in London University he attracted the attention of his professors and eminent men of science. During these years he contributed many scientific papers on electricity and magnetism under his own name of M.F. O’ Reilly and organised many award winning exhibits, notably in London, Vienna, Paris (1886), and Chicago (1893). His chapters in ‘ Electric Illumination’, the standard textbook on the subject of the period, on the voltaic arc and electrical measurements contained much of his own original research. The co-author was Silvanus Thompson and it is almost certain that he collaborated with Oliver Lodge and Ambrose Fleming in their experiments. Both were subsequently knighted for their contributions in electromagnetic radiation and diode valves. Apart from his scientific achievements, Brother Potamian left his stamp on Catholic education in London. While director of St Joseph’s, Clapham, he was instrumental in the transfer of the college to Tooting between 1886 and 1888. Although there was opposition from non-Catholic sources a serious lack of finance and doubts amongst his confreres within the De La Salle order he never wavered from his task. This magnificent college is a memorial to his foresight and perseverance. In 1889 he stepped down as director of the new college to concentrate on his teaching and scientific interests. During this year he was elected a Member of Convocation of the University of London. Brother Potamian’s appointment to Waterford in 1893 as Professor of Physics came at an opportune time. Permission had been obtained to open a new Teacher Training College. The Training College was opened in the old building in the summer of 1891. Br. Potamian had to teach in this old building. By June 1894 the new College with its new science laboratories was ready. Br. Potamian now had at his disposal laboratories where he could perform interesting experiments. In 1895 the German Physics professor Wilhelm Roentgen discovered x-rays. On 28th December 1895 Roentgen gave his preliminary report ‘Uber eine neve Art von Strahlen’ (On the new form of Radiation) to the president of the Wurzburg Physical-Mechanical Society, accompanied by experimental radiographs and the image of his wife’s hand. By New Years Day he had sent the printed report to physicist friends in Europe. Translations appeared in the newspapers and scientific journals of the time and physicists who had access to the requisite equipment repeated his experiments. Professor Roentgen’s paper had appeared in the London Electrician telling of the remarkable discovery he had made, of certain rays which could pierce solid substances. The limited Knowledge of the nature and effects of the Roentgen rays, even among scientists, was sufficiently indicated by their proper name which still adheres, namely, x-rays. It was something of an event therefore, when on April 13th, 1896, Brother Potamian was able to provide a practical demonstration of their use in De La Salle College, Waterford. He having being requested by and in the presence of Dr. Atkins and his medical team in Waterford, he took a radiograph that revealed the presence of a steel splinter in the hand of a young woman. This x-ray was the first of its kind in Ireland. The radiograph was taken with a six-inch spark coil, a small focus cathode ray tube and a wet photographic plate with an exposure time of one minute. The splinter was successfully removed by Dr. Atkins. The photographic plate was preserved until 1956, when unfortunately it was lost while on loan to an exhibition in New York. However a photographic print is available which shows a needle-like metallic foreign body about 1centimetre long between the heads of the middle and ring finger metacarpals. Br. Potamian appreciated the need for a small focus and the print is remarkably sharp. The reporter added that Brother Potamian had given the New York Hearld the only copy in existence for reproduction in the paper. The feat that Brother Potamian thus performed at the request of Dr. Atkins gives him claim to rank as one of the first to use the x-ray in Ireland. The New York Hearld referred to him as ‘one of the pioneers of radiography’. “It was only after a comprehensive study of the properties of the rays that Professor Roentgen wrote the historic paper that he read at a meeting of the Physico-Medical Society of Wortzburg 1885. Shortly afterwards it was translated and published in the leading scientific journals of the world. The photographic possibilities of the x-rays, everywhere described in glowing terms, appealed strongly to the lay and scientific mind, and secured for them a prompt, sensational and worldwide reception”. “As Professor Roentgen’s paper contained no directions concerning the technique of the ‘new photography’, the first experimenters had to find for themselves everything relating to the sensitive plate and its development, as well as the distance of the x-ray tube and the time of exposure”. Scarcely three months after the publication of the paper in the London Electrician, he was urged by a physician in Waterford to overcome personal reluctance and contribute to the relief of a suffering woman. Brother Potamian O’Reilly evidently overcame those initial difficulties successfully because the print from this De La Salle College plate is sharp enough to show bone detail and trabecular pattern quite clearly. “During my course of training Brother Potamian was not a resident professor at De La Salle College. He came periodically to us, gave us a certain number of lectures and then returned to London. The incident I wish to note must have happened towards the end of 1992 or early 1893. As he reached that part of the course which treats of telegraphy and the telephone he showed us a microphone that he had constructed himself, and explained how he had been able to make himself heard in various parts of the College by microphone and telephone receiver. He then remarked that before long it might be possible without any wires at all. He then returned to London. On his next appearance amongst us, he prefaced his first lecture with the following prophetic remark: ‘I have a great announcement to make to you. Since I last had the pleasure of seeing you, a young man and myself have succeeded in sending a wireless message across a room; all that is necessary now is to put up machinery powerful enough to send wireless messages around the earth, and I have no doubt that most of you who are now listening to me will live to see the day when you’ll be able to sit by your fireside and listen to speeches and concerts from London and elsewhere, and some of you, perhaps, may live to see the day when not only can you listen to speakers in distant parts, but actually see them on the screen”. Marconi’s historic wireless message across the Atlantic took place in December 1901 and John Logie Baird did not publicly demonstrate his television system until 1925. In August 1896 Brother Potamian was transferred from Waterford to Manhattan College, New York, the De La Salle orders most prestigious institution in America and a college of university status having been granted a charter by the university of New York in 1863. For the next twenty years of his life he devoted most of his time to the development of the college’s school of engineering. He continued his interests in electricity and magnetism and he wrote many treatises on both. Just before his death on January 20th 1917 at St. Lawrence’s Hospital, New York the New York Hearld described him as “one of the pioneers in radiography”. A measure of his international reputation as an educator and scientist were the many eulogies that appeared after his death in educational and scientific journals around the world in English, French and Italian, all paying tribute to him as a pioneer in electricity, radio and x-rays. In an obituary, the Electrical World likened him to Lord Kelvin and Joseph Henry. Of course his lasting legacy to De La Salle College, Waterford is the development of the College reputation as an educational establishment devoted to the teaching of science. This legacy continues to the present day where huge numbers of students study Physics, Chemistry, Biology, Agricultural Science, Applied Mathematics and Mathematics and become practitioners in many scientific areas. De La Salle College has a proud association with the Gaelic Athletic Association from its inception in 1884. The College fielded teams in both Hurling and Football from 1887. Between De La Salle College functioned, as a Teacher Training College and many famous players and officials were educated in this famous nursery. Born in Upton, Co Cork in 1890. Played hurling and football for De La Salle College and his native Cork. He was President during the GAA’s Jubilee Year 1934. He became chairman of Cork County Board in 1917. Sean took part in the War of Independence. He was a member of the Munster Council for many years and served as chairman. Was a member of Cork County Council for twenty years and Cork Corporation for twenty-two years. He was elected Lord Mayor of Cork on five occasions and served as T D in Dáil Eireann for eighteen years. After a lifetime of service to the GAA Sean died in 1974; aged 84. Bob O'Keeffe was born in Glengrant, Mooncoin in 1881. From an early age he was interested in sport, especially hurling. While doing his teacher training in the De La Salle College, Waterford, he won trophies of all sorts, some of them are still in good order in his old homestead. When he graduated, he got an appointment in Dunboyne, Co. Meath. Bob had never played for his county. But in 1908, as Meath had not played in the Railway Shield Championship, Bob was included in the Leinster side as a member of the Mooncoin Club to play Tipperary and they won by 0-14 - 2-5. Bob O'Keeffe never did play for Kilkenny. He subsequently took up a teaching post in Borris-in-Ossory, Co. Laois, and though then in the veteran stages, played a major part in helping win their only Senior All-Ireland Hurling Title in 1915. He played in that game. He then became a prominent figure in the G.AA Councils and was President of the Association from 1935-38.While he was in Dunboyne, Co. Meath, he twice won the Long Puck Championship of Ireland. While he was secretary of Laois County Board he acquired and purchased O’Moore Park, Portlaoise. He was the longest serving Leinster Council Chairman. Robert died in 1975. After his death the G.A.A. decided to donate a trophy in his memory - The Bob O'Keeffe Memorial Cup. It was to be given to the winners of the Leinster Final each year. The trophy is a massive affair, standing 3 feet 8 inches, weighing 564 ounces and has a capacity of 6 gallons. The Celtic chase work has been taken from The Book of Kells. The hurler depicted on the top of the Cup is barefooted, which is significant in view of the fact that the late Bob O'Keeffe originally played in that manner. The original Bob O'Keeffe Cup was kindly donated by Comhairle Laighean in June 2005, and went on immediate display in the museum's temporary exhibition area. The Bob O'Keeffe Cup is awarded annually to the winner of the Leinster Senior Hurling Championship from 1950-2004 and was replaced by a new version in 2005 also named the Bob O'Keeffe Cup. He was born in 1896 in Co Armagh. Served two terms as chairman of the Ulster Council and is the only post 1921 president to serve more than three years. He was prominent in promoting the Irish language in Ulster. Was secretary of Comhaltas Uladh for 25 years. Was president of St Brigid’s College, Rann na Feiriste. Died in 1975. Born in 1887. A native of Tents, Co. Leitrim, but had lifelong association with the GAA in Roscommon, where he lived for 44 years. Founder, secretary, chairman and president of Tarmon GAA club. An inter-county footballer with Roscommon in his youth, involved in re-organisation of GAA there in pre-1922 days. Member of Roscommon county committee for many years, including two terms totalling 15 years as chairman in 1935-1948 and 1954-1956. Chairman of Connacht Council for two terms. Took part in War of Independence, was member (including chairman) of Roscommon County Council for 40 years, member of Dail Eireann and Seanad Eireann. Dan died in 1968. A native of Wexford, member of Laois county committee from 1922 to 1929 while resident in that county. Later secretary of Wexford county committee and member of Leinster Council for over 50 years, including term as chairman from 1942 to 1944. Took part in 1916 Rising in Co. Wexford as 17-year-old Fianna Eireann member. Lifelong worker in language movement, closely associated with Coiste na Rinne (Co. Waterford) and co-founder of Coiste Charman (Co. Wexford). Leading local historian, authority on 1798 Rising. A former hurler and footballer with both the Moneygall Club and Tipperary, he was renowned as a fine athlete (winning fifteen county titles in events such as the long jump and sprinting) and he was selected by Tipperary management, for both the junior hurling and football teams of the 1940s. Earlier, while studying in De La Salle College in Waterford he won two Waterford senior football championships and in both years in which he studied there he won the Gold Medal as the best all-round athlete. A Primary teacher by profession he taught most of his life in Dunkerrin NS in his native parish. Elected Secretary of the Moneygall GAA Club, , he had a keen interest in administration and was elected vice-chairman of the North Tipperary board in 1955, moving on to become Chairman two years later. A Tipperary delegate to Munster Council, he became vice chairman of that body in 1962 and Chairman in 1965. 1955 saw Seamus elected vice-chairman of the Board, moving up to chairman two years later where he would guide its affairs until 1966. Meanwhile, his value as an administrator had become more widespread because in 1958 he was elected one of the two Tipperary delegates on the Munster Council. In 1962 he was elected vice chairman of the provincial body and its chairman in 1965. His presidency marked some very important developments in the GAA and among his achievements were the setting up of the Commission on the Affairs of the GAA, the establishment of the first links with Australian Rules, the launch of the Club Development Scheme and the erection of the indoor Croke Park Handball Courts while the Scor competitions also came into being during his Presidency. One of his greatest achievements came shortly after the ending of his Presidency when with Tommy Barrett and Eamonn De Stafort he was involved in the setting up of Féile na nGael in 1971. The positive effects of this have been felt by countless thousands of young hurlers in the intervening years as the Féile youth hurling festival became one of the great success stories for the Association. Seamus continued to serve as National Chairman of Féile until 1986. Only weeks after he celebrated his 90th birthday he was inducted into the Hall of Fame by the Tipperary Association in Dublin. He died in 2007.